Eliminate Full Price: Yipee for Skippy! How I spent $5.41 on items worth $41.61! Yipee for Skippy! How I spent $5.41 on items worth $41.61! I'm a sucker for peanut butter. I went to Safeway Thursday night and got a copy of their "Joy of Football" coupon book. 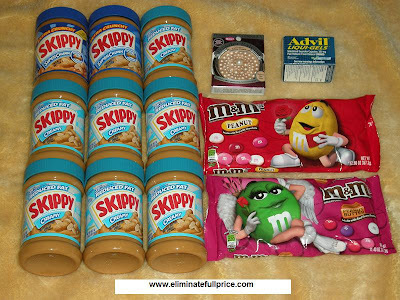 When I flipped through it at home, I saw a manufacturer's coupon for $1 off any 1 Skippy Peanut Butter. Since I saw that coupon, I went back to Safeway on Friday and got a few more copies of the coupon book. For those who don't know, if there's a manufacturer's coupon found in a store, you can use it at other stores too. The keywords here are "manufacturer's coupons" because it means the coupon is produced by the maker of the product and not the store. It basically means that even though I found the manufacturer's coupon for Skippy in Safeway, I can use it at CVS. That's exactly what I did today! Then I used the CVS gift card I earned from My Points to cover the remaining balance after coupons. I got back $7 Extra Care Bucks from buying 1 Physician's Formula product, $5 Extra Care Bucks from buying $15 worth of Skippy Peanut Butter, and $1 Extra Care Buck from buying 2 bags of Valentine's M&M's. That's $13 Extra Care Bucks total! $41.61 total without coupons/discounts - $5.41 total with coupons/discounts = $36.20 full price eliminated! Where did you get the $5/$25 coupon?